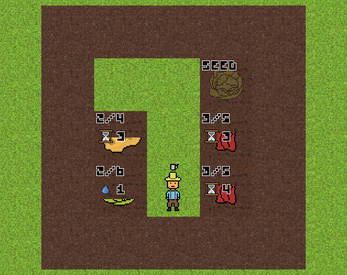 A simple puzzle game about growing food. Try to grow and gather all the food on the field in as few moves as possible. When you start a level, all plants start as seeds waiting to be grown. They will remain in this state until start growing them. You can do that by entering a field containing the seeds. Every plant has several stages of growth. Each stage takes several turns of time. After every growth stage, you have to water the plant, so it can continue to grow. If you don't water a a plant quickly enough, it will wilt and you will not be able to grow it any further (nor gather it). Once your plant has gone through all the growth stages, it should be ready to gather. You have to do this within several turns, or your plant will wilt. The game ends when all the plants on the field have been gathered or have wilted. The font used in the game is called "TWELVE SF - v2" and it was created by somepx.itch.io.